Before we proceed further into the thought process let me make it clear the two devices we will be talking about, The first one is of course Google’s own Nexus 7 and other being Samsung Galaxy Tab 2 (the 7 inch one). Since I am from India, the amount consideration will be in Indian Rupees. So let me bring forward the thought process behind my choice of Google Nexus 7, the tablet I bought. Why is Nexus 7 Better? Google Device – Trust me this one is the first thing you should think about. Nexus 7 is made by ASUS and have Google branding to go with it. So when Google releases updates to the Andorid operating system which happens a lot, this device will keep getting the updates for a longer time and before anyone else or Samsung Tab 2 in our case. Community – Again this is a Google device, so it will have lot of community and developers attached to it. You will be able to find more tweaks and related developments related to this device than any other device form the competitor. Believe me people are working on porting jelly bean on Google Nexus mobile already after 2 years on. US $25 credit in Google Play Store – Now who does not want some free stuff, everyone does. So instead of getting paid apps from other sources you’ll be able to make purchase from the Play store itself. Although this is available to users located in the US only, but believe me there are ways to get it outside US too. I’ll be posting a guide myself soon. Add to top that $25 it also comes along a free download of the movie – ‘TRANSFORMERS Dark of the moon’. Screen Resolution – Nexus 7 has the best screen that happened to android yet. It has 1280 X 800 pixel screen which forms around 216 PPI (Pixels per inch) which is comparable to iPad’s retina display with 260 PPI. Samsung Tab 2 has a Low pixel densitiy screen, below with 170 PPI with 1024 x 600 screen resolution. Quad Core Processor – With NVIDIA Quad Core processer compared to Samsungs Dual Core processor Nexus 7 is a winner clearly. Plus Nexus 7 also has a NVIDIA Graphics Processing Unit so all modern day games will run super smooth on it, this is which Samsung Tab 2 lacks. Available between Rs. 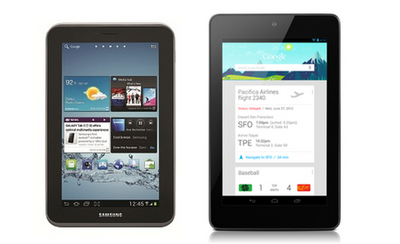 16,500 – 17,500 in India – whereas Samsung Galaxy Tab 2 costs around 19,000. Now these were all the good things about Google Nexus 7, let us now talk about what according to everybody else are negative points about Google Nexus 7 when compared to Samsung Tab 2. Missing Camera – Really? Do you really care about capturing photographs from your tablet. Just think about it once, these days everyone has a smartphone equipped with a better camera quality than what comes on the Tab 2 then why one should think of the camera in first place? And Nexus 7 do have a front facing camera better than the front camera on Samsung Tab 2 for video conferencing purposes. Also there are already apps available in the market for free to use front camera to record videos and click photos. But according to me this is not a point to consider if you think about it from a tablet perspective. No 3G Support – Now this also is not really a bad thing. Think about times you will actually go out to a bizarre location with your tablet? And in case even if you go out, you’ll always have your mobile phone with you! And again if its android it can easily turn into a WI-FI hotspot to satisfy your needs. No Phone Support – If you want to call, will you pick up or buy a tablet? It’s too big to use it as a phone. You already have a smartphone to call everyone in the world. Also Samsung Tab 2 just allows 3G surfing and Call functions on their tablet, you won’t be able to send MMS and text messages with it so it can never replace your phone. Missing Micro SD slot – It’s a tablet and for that 8GB memory is pretty enough considering that its connected to cloud and you will have access to all those files every time and everywhere. These were my thought while I purchased a Nexus 7 tablet for me. Are you a Samsung fan? What’s your take on the stuff I explained here? Hit me with comments and I’ll be happy to answer or reply to any queries you might have.